What are electrosurgical units and why should we test them? Let’s start with the basics. Electrosurgical units (ESU) use a high-frequency electrical current to cut tissue and control bleeding by causing coagulation. Tissue resistance to the high-density current causes a heating effect which results in tissue destruction. Electrical current is delivered and received through cables and electrodes. The electrodes may be activated by either a handpiece switch or a footswitch. The ESU may use a monopolar or a bipolar mode. In monopolar mode, electrical current is delivered to the patient via an active cable and electrode. As shown in Figure 1, current returns to the unit through a return electrode pad or plate to disperse the return current, thus preventing focused heat which can cause burns. In bipolar mode, two electrodes, typically the tips of a pair of forceps or scissors, serve as the equivalent of the active and dispersive leads in the monopolar mode. See Figure 2. Modes of electrosurgery: CUT vs COAG. There are two types of cut modes: blended cut and pure cut. Pure cut is typically used for dissection only. In pure cut mode, the surgeon achieves a cut that is very similar to an incision produced by a medical scalpel. The cut is narrow, deep and the surgeon has little or no control over bleeding. As shown in Figure 3, this effect is obtained by high frequency and low voltage. In blended cut mode, the surgeon achieves a much wider incision by heating up the tissue and letting it cool. This is achieved by lower frequency and higher voltage than pure cut. 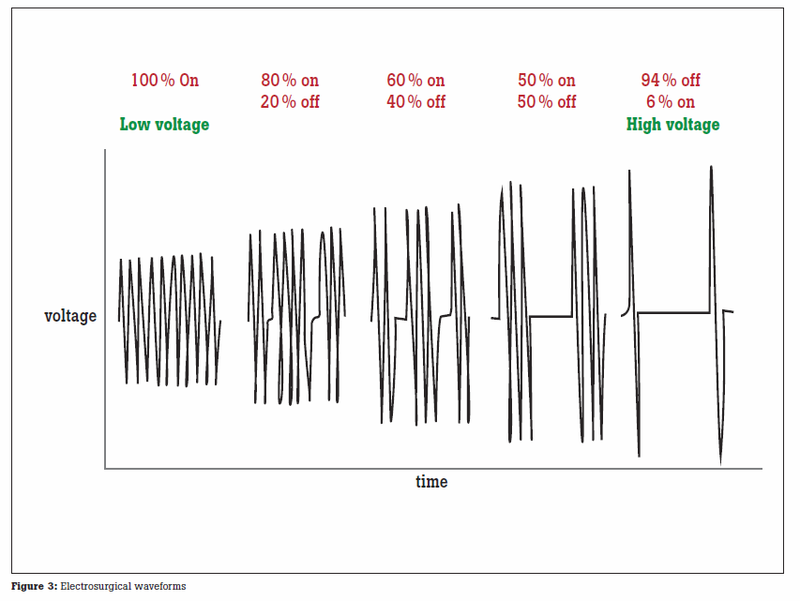 Coagulation is performed by using high voltage and low frequency. In COAG mode, heat is incapable of explosive vaporization, therefore, resulting in a thermal coagulum, also known as a clot. In COAG mode, the surgeon has more control over bleeding because the tissue is allowed more time to cauterize in between contact. The performance and safety of electrosurgical units are of the utmost importance and requires regular testing to ensure patient and staff safety and to manage the risks associated with the use of high and low frequency electrical current on the human body. Stay tuned for more info on the 10 best practices for testing electrosurgical units. Michael Raiche, Fluke Biomedical Product Manager, is responsible for several Biomedical product lines. He has Mechanical Engineering and German degrees from the University of Rhode Island and an MBA from Harvard Business School.